The Sudatel Data Center is one of company’s greatest achievements. Some $45 million (US) went into building the 14,000 square meter expanse (figures sourced from the Company). It aims to supply the highest level of IT infrastructure, reliability, and network monitoring along with data and power backup. Data centres are the mental powerhouses of companies, and the site where the most critical of processes are run. 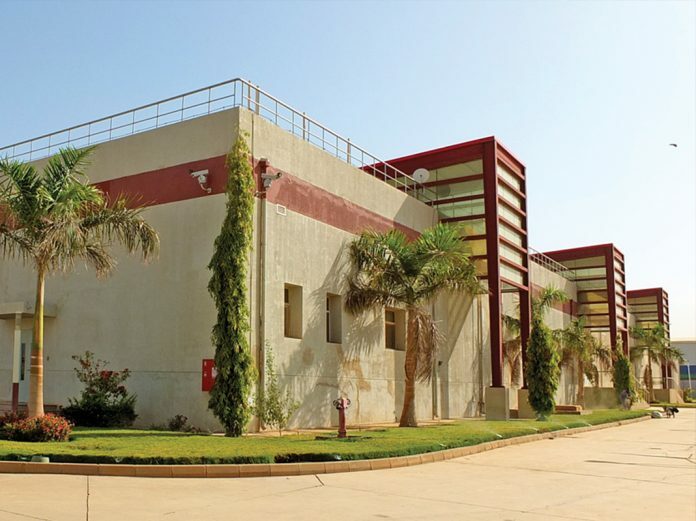 The centre provides services for subscribers in Sudan and worldwide, in north and east Africa and these tend to be one of three parties: companies, members of public, or telecommunications service providers. The project matches the highest worldwide standards. It is a tier 4 data centre that calls for data to be available at all times with an accuracy of 99.995 percent. Safety and protection is a key priority. The premises are under constant surveillance by a 24-hour security team guarding all entrances and equipment. Its building management system monitors electric current, batteries, generators, water leakage, fuel levels, and weather conditions such as heat and humidity levels. External and internal CCTV cameras abound (there are over 100) and an intrusion detection system is in place. Entrance points are controlled via the access control system. Various building rooms need several entry methods: finger print, iris recognition, a card and access code. Preventing a fire is a main concern. There is a state-of-the-art alarm and fire control system, water sprinklers and network and data rooms are supplied with sophisticated fire extinguishing systems. Generators and battery rooms are supplied with carbon dioxide fire extinguishers. The center is supplied with various power and backup sources to ensure no power cuts. It also has dual power supply lines from two separate stations and a fuel tank reservoir with enough fuel to keep the center running at full capacity via diesel generators for one week in addition to UPS and batteries which feed the sources. There are six cooling units in addition to two spare ones in each data room which pass cold air under the network cabins through a 90cm raised floor. There is a so-called communications room which is the meeting point between the data centre network and other networks through various service providers. It provides an extra level of protection against connectivity discontinuity. The data network is the heart of the data centre designed with high transfer rate capacity using fiber optic cables which have adopted the latest switches and firewalls to support cloud computing and virtual systems. Then, in the center of the main building four data rooms are to be found and these have a combined area of 1,424 square metres and together can hold up to 700 racks to reach a user capacity of 1,000 per room. The Network Operating Centre (NOC) is one of the most important areas of the building and the site where the network and equipment are monitored 24/7. In close proximity to the NOC is a 21-seat meeting room equipped with the latest audio and video equipment for varied business purposes. The centre provides what it calls “a varied and safe set of basic and supporting services”. These have been designed to help reduce customers’ establishment costs and allow for reduced time to market as well as to allow the client to develop and focus on their field of operations and area of expertise. The basic services comprise: a colocation service, a dedicated server service and a virtual server service. Meanwhile, the supporting services can be divided as such: data security and protection, an expandable SAN storage service, a client equipment monitoring service, and a data backup and restoration service. For the colocation service, the client rents a specified space on a rack, a whole rack or a group of racks. There are multiple advantages to using such a service, such as benefitting from a plug and place system, a rack with a 42 U height, two power supply options (20 or 30 amps) and two options for connectivity via protected fiber optic cables or UTP cables. There is a dedicated server service at the centre and this entails several options for a client-chosen operating system. Virtual server service is a flexible way to provide servers with different levels of services, depending on the memory needs, storage space and application speed requirements. Large-scale operations have complex IT infrastructures with a substantial amount of hardware that still need to be housed properly in rooms that are properly kitted out to do so, in spite of the steady miniaturization of the computer because the functional scope has increased. Sudatel’s data centre responds to this continuing need.